I am in love with this beautiful anniversary card today by Larissa! 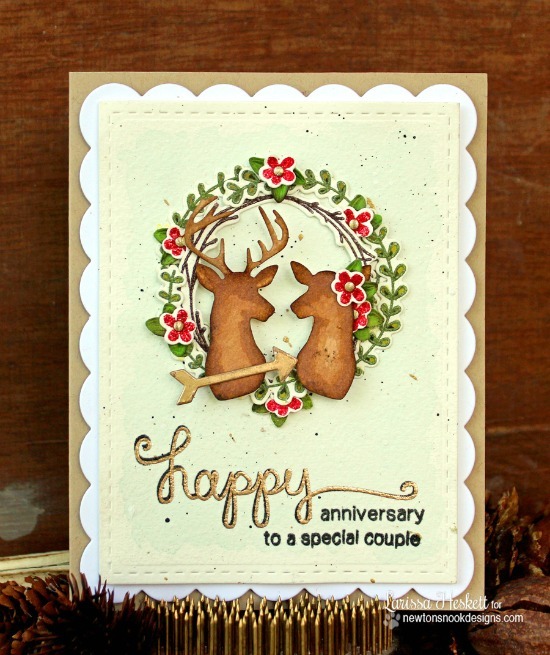 She created and adorable deer couple using our new Splendid Stags die set. The stag is included in the die set but to make a doe she just flipped the image over after she cut out a stag and trimmed off the antlers! What an amazing idea to stretch your products! She then added the couple to the card with a pretty layered wreath images stamped from our Happy Little Thoughts stamp set and cut out with the coordinating Happy Little Thoughts Die Set. To finish it off she used the Happy Anniversary sentiment from our Simply Sentimental stamp set nd the "to a special couple" from the Holiday Smooches stamp set. Thanks so much Larissa for making us smile! 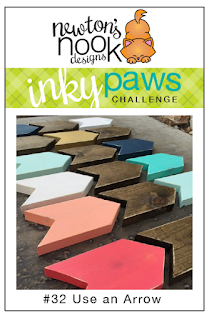 To see more beautiful projects by Larissa, head over to her blog, Larissa Heskett Designs and say hello to her today! There's still time! Our challenge closes Tonight, Friday, June 10th at Midnight CST time. To enter, all you need to do is create a card or project using some sort of ARROW and NND products! This is incredible cool and so super awesome - I know just the couple I would send this to!! Such a great idea to put those deer in the wreath like that - love how the sentiment looks too! !